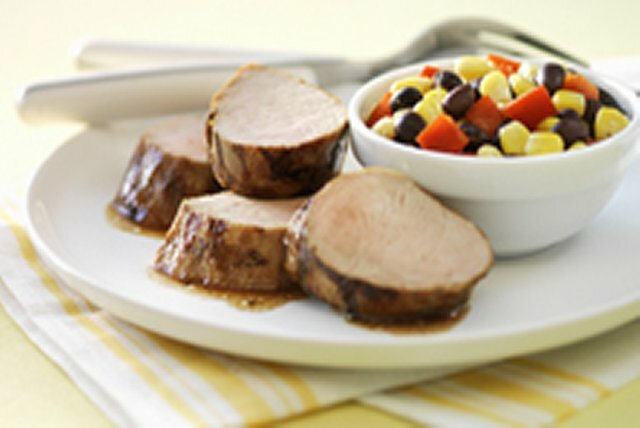 Tender, grilled pork tenderloin is a quick-cooking main. Served with salsa on the side, it's great for casual entertaining. Reserve 1/4 cup dressing. Grill meat 12 to 15 min. or until done (160ºF), turning occasionally and brushing with remaining dressing. Meanwhile, combine beans, corn, peppers and reserved dressing. Slice meat. Serve with corn mixture. Substitute canned pinto beans for the black beans. For extra colour and flavour, add 2 finely chopped green onions to the corn relish. Pour 1/4 cup dressing over meat in shallow dish; turn meat to evenly coat all sides. Refrigerate 30 min. to marinate, turning occasionally. Remove meat from marinade; discard marinade. Place meat in shallow pan. sprayed with cooking spray. Bake in 400ºF oven 25 to 30 min. or until done (160ºF). Not only does the red pepper make this tasty recipe a good source of vitamin C, but the entire recipe provides a high amount of dietary fibre per serving.